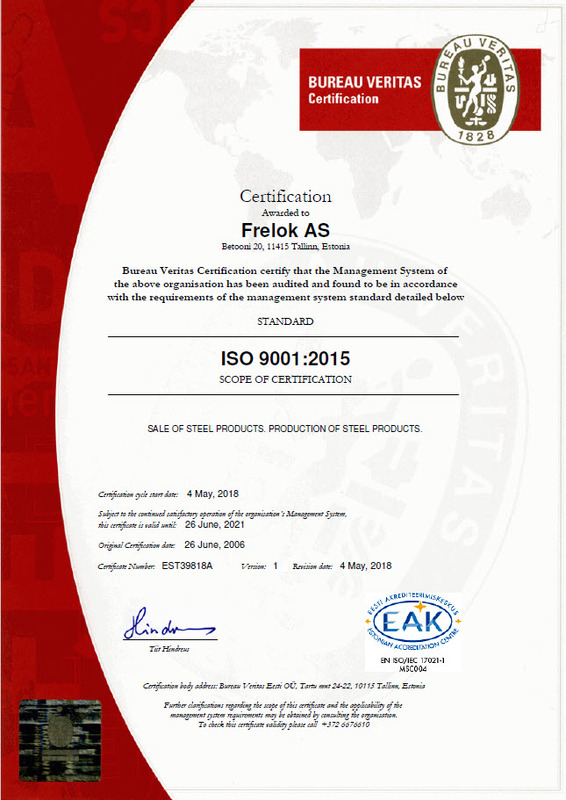 FRELOK joint-stock company has been continously and successfully engaged in commercial activity since 1992. Mr. Andrei Sidorov is the Chairman of the Management Board and Mr. Andrei Cherkasov is the Commercial Director of the company. The main activity of the company is focused on steel wholesales in Baltic region as well as a manufacturing and galvanizing of welded grates and stairs. The head office and production-warehouse complex are located in Tallinn, near Ulemiste railway station and Tallinn-Narva highway. The company owns a railway siding. FRELOK JSC specialized in sales of carbon and low-alloyed steel products from stock as well as in projects support. Thanks to many years of experience within the scope of activity, the company has good relations with the largest steel producers and mills in Europe, Russia and Ukraine. Our warehouses offer constantly ca 15,000 tons of various steel products and the storage area makes about twenty five thousand square meters. FRELOK is joint owner of Galv-Est, the largest galvanising factory in Baltic region. The company owns the facility for hot-dip galvanizing of steel products, including large galvanizing bath of dimensions 14x3x1,6 m. Processing capacity of the plant makes over 1,000 tons of various steel constructions monthly. FRELOK JSC is a dynamically developing company that intends to follow high service standards in the metal trade. Wide range of offered products, fast and professional service, flexible price policy and individual approach to every client are our priority. We succesfully cooperate with the largest public and private enterprises as well as with small companies in Estonia and abroad. In 2006, the company successfully implemented a quality management system according to the standard ISO 9001:2000. Today, FRELOK JSC is one of the leading metal trade enterprises in Baltic countries. The company development plan pursues a growth strategy in aspect of inceasing of sales volume, investments into processing and pre-sale preparation of steel products. We count on further increasing of demand for steel products of high processing level. Our goal is to establish a service centre in order to provide the customers with products of high conformity with possible requirements.